The Perfect Beach Cottage. Walk to Beach, Heated Pool, Porches, Clean & Fresh! WELCOME to Shellbox Cottage. Our fresh, fun, bright & clean & classic 'Old Florida' Beach Cottage just down the street from the Gulf of Mexico. As availability for Shellbox is limited, please - do not request a booking until we settle date availability via an inquiry first - and if the cottage is a match for you (for people with disabled or young children please take a look at the loft steps first as they are steep - although most kids love the loft). Are you tiring of white wall cookie-cutter condos? Admittedly, some have great water views during the day - although my dad used to say "you can't see the ocean at night"! Kidding aside, if you're looking for that piece of old Florida, one of the only free standing condo cottages on island with a pool and tennis court and a very short walk to the beach -- then the Shellbox Cottage may be for you. Although it is not for everyone! Read on, especially the last paragraph. 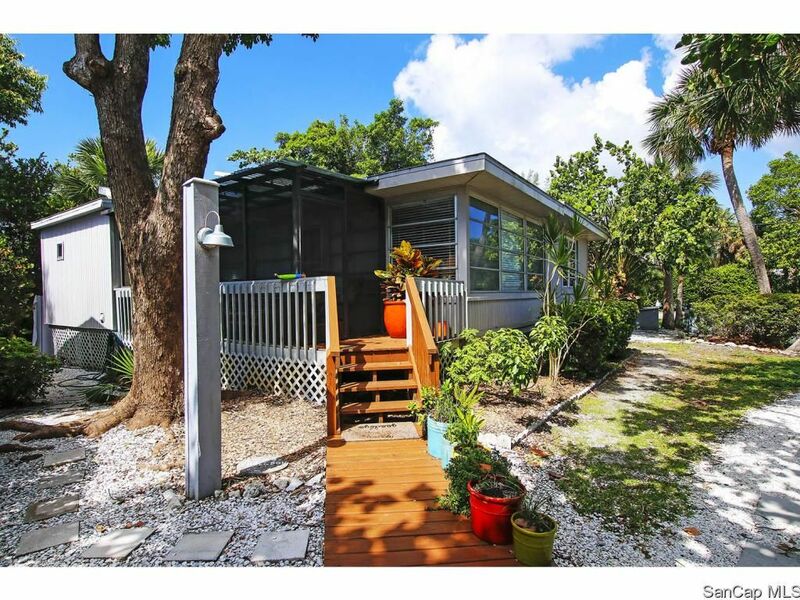 - We only rent Shellbox Cottage about 8x a year (it can only be rented 1x every 28 nights per Sanibel City rules). We use it 2-4 times annually. As New Yorkers we lend it quite often to a wide circle of family, friends and colleagues. It might be blocked for a honeymoon or wedding for a friends child - so we may be able to move dates around. This is why we suggest ALWAYS writing first. However for 2020 only April remains and Easter always rents. - 'Is a true cottage?' Yes! It was moved from the beach in the 1960's. It is NOT a duplex. There is no one above you. There is no one below you. Nor on the 'other side` of a wall, or the worse, outside on a balcony (we use to rent!). It's a classic - original wooden walls, wooden floors & important details like true/real wooden blinds. A classic mid-century Florida design, (mistakenly preserved!). A great design lead to a very bright and inviting home. Our attention to detail means it's kept fresh and clean. Sanibel Islands first Real Estate Agent lived here (Pricilla Murphy). The woman who named Periwinkle. - The pool (heated) is only a few steps from our back door. Shellbox Cottage is one of very few true old free-standing beach cottages left on the island with a pool and tennis court. Additionally, the pool deck, the pool heater, the tennis court and BBQ's are all brand new! - The beach is a very short walk away. The famous 21+mile Sanibel multi-use path is right outside our front door. Your kid will make it in 2 minutes but it will only take you 3-5 minutes to catch up. Use `Google Street view` to see exactly how short your walk would be. One of our photos is taken right from the cottage - you can see the Holiday Inn (now The Sanibel Beach Resort) down the street - which is right on the water & a great place for a cocktail your first night or a dinner - then a stroll home. - Our fun, exceptionally clean, bright & easy to use beach cottage offers the best of two worlds - your own cottage but part of a small, pleasant association with a fantastic pool & tennis court on a 4-acre oasis of gracious, lush, quiet grounds with mature tropical trees. No one walking past your door, or worse, smoking outside it. This means no worries about a crowd at the pool. A quiet oasis on Sanibel, but close to everything. Donax Village is more than half occupied by owners who do not rent. They are our friends and neighbors, so we are always delighted to rent to respectful people. Also, while it does sleep 6 nicely keep in mind futons are not as comfortable as beds - so it's best suited for a months stay - for 2-4 people with the occasional guests, like children or grandchildren on the futons and in the loft. The beds are brand new (within 3 years) [with mattress pads/blankets/linens cleaned each time] & the master bedroom hosts a 2015-16 Tempur-Pedic king [no eating or drinking in bed please]. Your own cottage, no shared walls. All yours. An Unusual 5 places to relax outside! 2. SCREENED IN BACK PORCH. Perfect for morning coffee. naps, looking over the pool or waiting for the cook to come back from the Weber) BBQ grills. 3. POOL DECK. Chaise, chairs and dining tables. We have lunch by the pool most days we are on Sanibel. 5. and of course the BEACH and thee Gulf of Mexico just down the street. Plus - a hot & cold shower in back - the finest shower in the world if you ask us! Two full bathrooms - the master bath, newly redone for 2017, was designed by a well known decorator from NYC & East Hampton NY in return for a stay at Shellbox! He also advised us to keep the charm of the original [and adorable] guest bathroom under the loft. Sanibel's famous bike path-- just outside our door. A big old box of everything: sand toys, boogie boards, umbrellas, shovels & pails, and even POOL RAFTS and some decent tennis rackets all for the price of putting it all away clean. Games, toys, the classic paperback book stack, some decent DVD's, videos, and a small diverse music library. An audio wire to our fantastic stereo system for your MP3 & Smart phone playlists. Entertaining items (champagne, wine, water, margarita & cocktail glasses, ice bucket, interior & exterior tablecloths, candle holders lobster pots, etc). One of us is a professionally trained cook so we have lots of kitchen toys. This is a true cottage (and it's pretty darn cute). It even sat on the beach in the late 1950/60's. It is clean. It's bright, comfortable & graceful in it's dotage and it has this really great energy everyone seems to feel the moment they enter. HOWEVER it is NOT perfect & it is NOT brand new (there are no Corian counter tops, no stainless steel appliances, nary a Sub-Zero refrigerator or modern new furnishings. THIS is by design! This would be more like borrowing your family's old beach house. We live in NYC. We are from NYC & Ohio originally. We rented here for the first time in 2008 and were hooked! We rented for several years before we bought the Shellbox and hope to retire here. 10 years to go. The cottage was designed by an architecture student as his graduation thesis. His parents were early developers on the Island and his mother refused to destroy the house. So it was saved and moved to this location. It's a great cottage - interesting and efficient layout, bright, old wood walls that still smell like the beach and it belonged to the islands first real estate agent - a woman - who also named Periwinkle! Several agents tried to steer us to the west end, which we love for it's seclusion but we really fell in love with the Sanibel Shores area. It is true the east end is busier - but we love the way streets run north south here (easier beach access) and we liked the convenience of riding our bikes to the Dairy Queen, the liquor store or a stroll home from Matzaluna or the Lazy Flamingo. We also think of ourselves and environmentalists. We see how many days we can go without using our car and this is the perfect part of the island for that. It's also kind of a romantic area in a way, so it's good for our soul. You could hop on a bike and be at Gulf in about a minute. Google earth it and see what the walk would be like! Shellbox no longer sports a landline -- but Verizon has put a new tower nearby and service is stunning. Some cottages have limited and/or shared parking - parking in your own private driveway (up to 3 cars) it's a joyful convenience! The recreation center offers day passes and it is a marvel. Comprehensive - award winning and only 6 miles away by the old Doc Ford. We workout almost everyday when there. TV, games, wonderful speakers and an excellent Onkyo system with MP3 audio wire. Since we tend to eat fresh food we selected a bottom freezer for convenience. Ice and champagne buckets, glasses for water, highballs, lowballs, wine, margarita and champagne. Outdoor tablecloths, candle holders and bar kit. The Donax Village green is just a lush lovely oasis on Sanibel - we love being on this property. We have a kayak for our own use, but if you are bringing one perhaps we can lend you our kayak carrier - please ask and we can discuss - experienced kayakers only please! Snorkle, fins, mask, kids floaties, life preservers, kadima paddles, sand buckets, What other cottage has all this great stuff! The Shellbox felt like a home away from home! The house was well situated near everything! When we pulled up and opened the door to the Shellbox we instantly loved it! It is what we expected the perfect beach cottage to be like. It is so charming, comfortable, and well decorated. We rented bikes and could easily bike from the Shellbox to the beach, restaurants, and shopping. We have raved about our experience with Frank and the Shellbox to everyone we know! We have two children (8 and 10) who loved everything about the loft, especially the little steps. The community pool was literally a short walk (mabe 15 steps?) from the back porch and we felt like it was private. We loved the established trees and beautiful flowers. Thank you Shellbox owners. Our vacation would not be so memorable without our home away from home. We had a wonderful time with our granddaughter. Easy to ride bikes to town from and the beach. We had a wonderful family vacation on Sanibel Island. Shellbox cottage has everything a family could need and it provides the privacy and a feeling of being at home that you won't get at a resort. Its just close enough to the ocean to stroll over with a morning cup of coffee. We rented bikes at Billy's and biked everyday from the cottage to various destinations on the Island. We enjoyed the pool and barbecue very much. The owners were extremely helpful and respond quickly to questions. I definitely would recommend vacationing on Sanibel and staying at Shellbox. Perfect little beach cottage ! The Shell Box cottage who’s more than what we imagined it to be. It was very cozy, convient to the beach, shopping , and the pool! We are looking forward to returning next year. Thank you Donna. May is a great month on Sanibel, really glad you enjoyed it. We will have our great cleaning person return those two little dresses to you ASAP and thanks for taking care of the Shellbox for May. Shellbox Cottage provided a comfortable, relaxing place to stay, in a good location on the lovely island of Sanibel, when my husband and I, and our children, 13 and 11 years old, visited in October. The owners have furnished the property with thought and style. It is very well equipped and providing the use of bikes, tennis rackets, pool toys, games, books etc makes the cottage feel like a home from home. The outdoor shower proved a hit and gave a real feeling of being at one with nature. Frank was a pleasure to deal with and went beyond what could've been expected by offering flexibility in our stay after we were delayed by hurricane Matthew. We hope we may be able to return one day, it is a very special place. Hello from Sanibel Katrina - It's January now and I'm on the Island and I just checked in and realized I never responded and thanked you for this really nice review. Thank you. I've been using the outdoor shower for you almost every evening! Come back sometime. We'd be happy to give you the old rate. And thanks for taking care of the Shellbox - all out guests were great this year - when we arrived back on January 1st we had few surprises. Shellbox is a charming renovated cottage with Old Florida appeal! My husband and I were fortunate to spend a month there. Shellbox is very open concept, brightly lit, impeccably clean and decorated with charm and warmth. It doesn't take long for it to feel like home! The large heated swimming pool is just steps away - it is virtually deserted in the morning so I swam lengths to my heart's content. The beach is a 5 minute walk away and all the beach equipment you could possibly want is provided. The complex is quiet and the neighbours are friendly and helpful - we even got invited to an Easter potluck :). The owners are easily reachable for any queries and are generous and accommodating. Location is great - restaurants and shopping a short walk or bike ride away. Just fabulous! Everything they say about Canadians is true! Lovely guests who stayed in touch and were patient with a rough spot here and there. Thank you and thanks for taking great care of the Shellbox. Many people know of Sanibel's tranquil beauty, pristine white beaches and laid back charm. But there are other things just as important to a vacation you may want to consider on your vacation. Sanibel & Captiva Island is one of the best place in the world for a beach vacation and shelling with half the island a federal wildlife preserve. We have visionary land which means few chain stores (no big box stores, no high rises and no buildings no taller than a Royal Palm Tree) so our Island is pristine and beautiful from one end to the other (no matter who's home you choose). No traffic lights. No McDonalds, no cars going faster than 35mph. Just laid back island life. There are over 21+ miles of paths for walking jogging strolling & biking - one of the finest in the United States and we are only 28 miles from and efficient and well planned `international` airport (& only 2.5 hours from Miami). Few great beaches in the world are this close to an international airport. And a narrow 3 mile causeway places it far away from everyday life. Come relax & reunite with yourself & those you love. NIGHTLY RATE FOR ILLUSTRATION PURPOSES. We cannot rent nightly (short term) per Sanibel city rules (this is not true for all cottages on Sanibel - only some in certain areas) Short term dates you see already blacked out may be times we or our (lucky) friends & family are borrowing the Shellbox - so - As these dates `may be able` to be changed PLEASE ALWAYS write us if you have dates you are interested in! Also we're happy to tentatively block dates for you before deposits are received although we prefer to talk by phone for these situations. There is an an EXTRA NIGHT Holiday Surcharge for NATIONAL HOLIDAYS ONLY/PLEASE INQUIRE if your days overlap the following dates on either side of these days: Memorial Day, The 4th of July, Labor Day, Columbus Day Thanksgiving, Christmas and New Years and Easter weekend. There is no surcharge for New Years if you stay Christmas Eve and Day. There are no other fees other than tax and cleaning. In addition to cancellation policy if we find another renter we will refund your payment entirely with a small fee depending on the amount of work and time involved ($200-300). We've only had to do this once.